Wooden pail held together with two metal staves. is lacquered. The pail was used in hand milking. Well used stainless steel milk pail with two handles. Milker hung from cow supported by strap going over back of the cow. 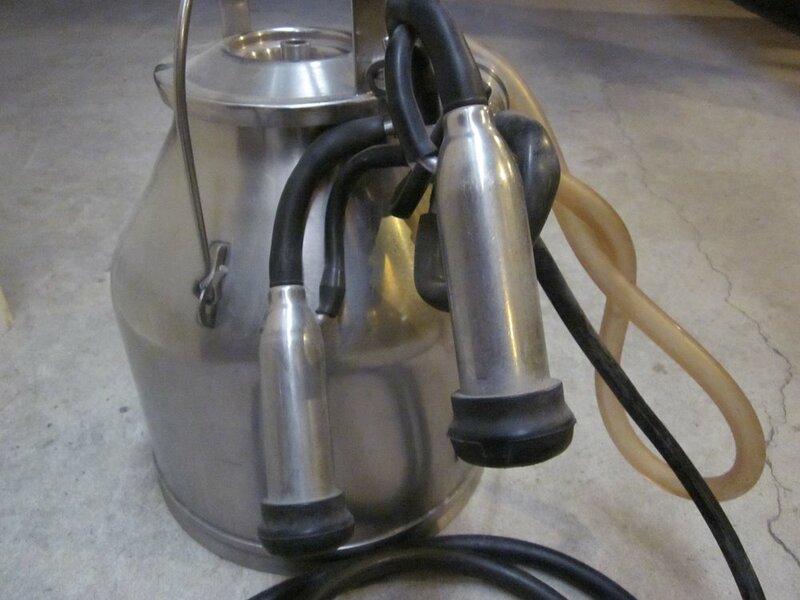 The milker is hooked up to a milker pump. Made by Babson Bros. Co.
Two teat, surge milker. Universal model 127. Stainless steel with rubber hoses. Surge orange and white box containing four black milking inflation devices. Black milking inflation device in a box of four. 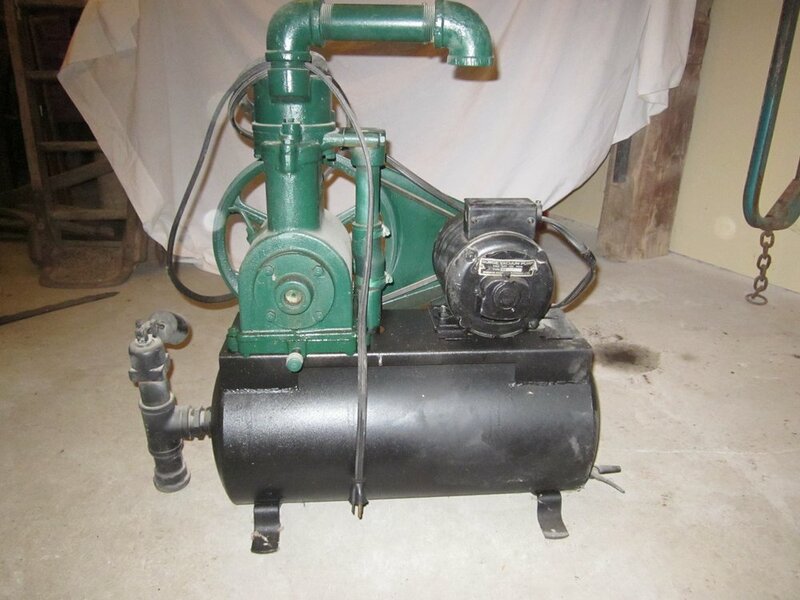 De Laval milk pump with attached General Electric Co. Motor. Pump painted red and motor black. Manufacturers plaque on motor and embossing on pump. Coca Cola bottle inside side cage of pump. Milking pump. Pump mechanism painted green. Rest of the body painted black. Embossed patent date on pump. Manufacturers plaque on motor. Large milk can used for storing and transporting milk to a cheese factory. The can was lowered into the well. The milk cans were lowered into the well to keep the milk cool before it was transported to the cheese factory. The arm can be turned and the milk can lowered on to the milk cart. Large milk can with a hole in the lid for pouring in the milk, Embossed plaque marked Charles Ashley, Foxboro, ONT. [Ashley Cheese Factory, Foxboro, built in 1871 by Harford Thurlow Ashley. A Cyclopedia of Canadian Biography: Being Chiefly Men of the Time ..., Volume 1 edited by George Maclean Rose. Cream coloured ceramic jar with blue stamped Conde on side. Red rubber hose coming out near top. 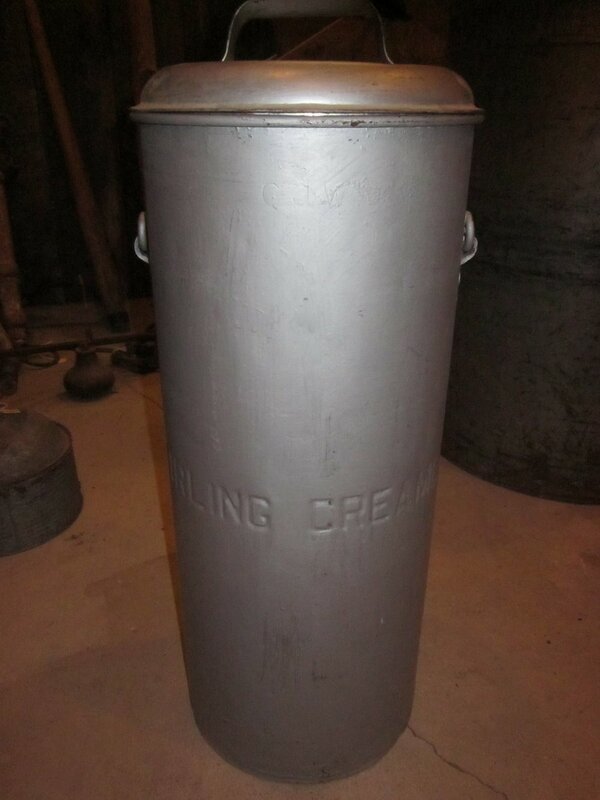 It is a container for lime used to clean the line of milking machines. Blue and grey De Laval teat cup rack with a slide holder for two sets of four teats. Used for cleaning the teats. Stainless steel milk strainer with two handles with some surface rust. Wide shallow milk strainer with detachable sieve used with a filter placed on top of a milk can. Box of paper filters used to strain milk. Rapid Flo Milk Filters, Johnson and Johnson Ltd. 6" plain disc. Piece of box lid is missing. Blue and white. Aluminum milk pail with glass insert for measuring and a spiget at bottom outside of pail. Great West Metal Products Ltd.
Dull grey cream can etched Stirling Creamery. McCormick Deering Cream Separator, post 1940 because it is Dubonnet Red in colour. Prior to 1940 McCormick Deering Cream Separator were cream. The bowl is marked 13.072.001b. 10 gallon Cream separator with three squared wooden legs. Painted teal on the outside, 10 gals put on top of paint. Three glass viewing slots and a tap at the bottom for removing skimmed milk.